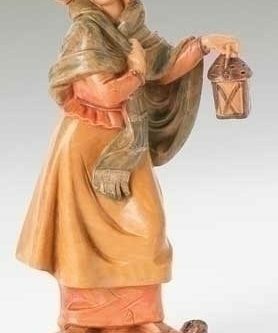 Add innkeeper’s wife, Elisabeth, to your set of Fontanini figurines. She devoted herself to seeing to the Holy Family’s comfort after the blessed birth. She offered Jacob’s old crib to Mary, but the new mother refused it. She told Mary upon their departure that she was now with child.